TEFL, TESL and TESOL are all certifications for teaching English to non-native English speakers. All of these certifications offer the same level of qualification to teach English. The one that’s best for you depends on who – and where – you plan to teach. So, which course is right for you: TEFL vs TESL vs TESOL? Read on to find out! A TEFL certification provides the skills needed to teach English abroad in countries where students do not speak English as their first language, such as China, Japan or Brazil. TEFL certification is the most widely recognized and highly regarded qualification of its kind around the world. While a 100-hour TEFL certificate is the minimum requirement set by many hiring bodies abroad, it’s important to note that at least 120 hours of TEFL training is the commonly expected standard for the highest salary teaching jobs around the world. TESL is a qualification for teaching students whose first language is not English, but are currently living in a native-English speaking country. For example, teaching temporary students, workers, or recent immigrants to countries such as the USA, UK, Australia and Canada. A TESL would be suitable for jobs in these countries such as a language support teacher for school students whose first language isn’t English. TESL courses are most relevant for those looking to teach English within their home country. TESL is also a highly respected ESL qualification in Canada. This qualification is newer and gives some flexibility as to whether you teach English overseas or in a native-English speaking country. However, while TESOL courses may cover a broader range of topics, they tend to study them in less depth. TESOL courses are not as widely recognized and are sometimes incompatible with some curriculum plans. The University of Toronto offers an online TEFL certification due to its global compatibility, wide recognition and continued success with students. To learn more and compare our courses, click here. Do you offer an online TEFL course? what is the length and cost of the program? What is the length and cost of the TEFL program? Hello Gilda, thank you for your comment! All students have one year to complete the TEFL Online program, at their own pace. The average completion time is 2-3 months. The cost for our three different courses can be found on our enroll page here: https://teflonline.teachaway.com/enroll/ You will be sent details to login to the course immediately after enrolling to begin right away. TEFL seems to be the option that has the most training. I would like to keep my options open so that I can teach English both in Canada and/or in a foreign country. Would getting a TEFL certification allow me to still teach in Canada, or will I have to get a TESL certification on top of a TEFL certification? Great question. A TEFL certification is designed to qualify teachers to teach English as a foreign language in countries where English is not the first or native language. A TEFL certificate is the standard qualification international schools look for when identifying qualified teacher candidates globally. If you wish to teach ESL in Canada we recommended consulting with the Canadian institution directly to determine what qualifications they require. Hi im currently living in singapore , and im planning to apply for tefl and teach in south korea, but i dont have a degree , will it still be possible to teach in korea? Hi, I am a Singaporean who’s semi-retired and may wish to stay in Vietnam for a period of time and perhaps considering teaching English to adult learners. Which would be the most appropriate course that I should purse TEFL or TESOL to meet my objective? Appreciate your valued professional advise. Hi, my name Meryem, i am interested in teaching English, i am so confused which certificate shall i get, I found different prices and different names of certificates. Please help me to find the right one. The University of Toronto TEFL Online certificate course is offered 100% online and there are no in-class, scheduled, or live components to the course. There are three difference course options the 100, 120 and 150-hour course. All courses meet the minimum requirements to teach abroad. Some employers may prefer teachers to have a minimum 120-hour of TEFL training, making the 120-hour course our most popular. If you are looking for a more comprehensive course you may be interested in the 30 additional hours of training offered in our 150-hour course. can anyone enroll in the online TEFL course from University of Toronto?- No matter academic background or nationality. Great question! There are no prerequisites to enroll in the TEFL Online program and no restrictions re: academic background or nationality. We currently have students enrolled in the course from all over the world. We look forward to seeing you in the course soon! I want to enter into the major of teaching english to foreign speakers in a classroom environment but I’m still not sure what program to do either Tesol or tefl what would be great for what I’m trying to do. I’m thinking of taking your TEFL program but I just had a question regarding teaching in Korea I have heard you need a degree is that true? Hi. As a native Korean I thought I would help. In recent years the regulations in Korea regarding work permits/VISAs for foreign teachers have become stricter than the past. The answer to your question depends on the what sector you are planning to teach in. In the private sector the regulations vary according to internal rules that establishment may have even if you pass the minimum requirements set by the government, in public schools you need a BA degree related to English or Teaching and teaching qualifications, in the college or university level, you usually need a MA or PhD or proof that you are pursuing a MA/PhD. I may be moving to Panama for a few months and I was looking into teaching English over there. What is the best program to take between TEFL, TESL and TESOL? If I already have a BA in Early Child Studies and English Literature, and a graduate degree in TESL from McGill, as well as 5 years of teaching experience in Canada (2 years teaching Elementary School, 1 year teaching ESL and 2 years teaching adult literacy), do I need a TEFL to teach in areas such as Prague, South Korea or Spain, or would that be enough? Hello Jasmine, thank you for your comment! Your degree and years of teaching in different capacities will most definitely benefit you in your job applications. You will, however, want to pay close attention to what employers are looking for in terms of education and if they require, or simply prefer, a TEFL certification. If TEFL is listed as a requirement then it is not optional and you must have a TEFL certificate to be considered. TEFL is an internationally recognized certificate in teaching English as a foreign language and it will prepare you for the unique challenges of the foreign classroom. Best, Christie. Hello Moeneera, Thank you for your question. Teaching English as a Foreign Language (TEFL) courses are not accredited, as there is no single governing body that exists for TEFL courses. What can be accredited, however, is the institution that designed/offers a TEFL course. In the instance of TEFL Online, the course was designed by professors at The University of Toronto OISE and is offered by Teach Away Inc. There are no prerequisites to enroll in the TEFL Online course and you can begin the course at anytime by visiting: teflonline.teachaway.com/enroll The widely accepted minimum requirements to teach abroad are a TEFL certificate and bachelor’s degree in any area, and – for example – you do not need a teaching license to qualify for entry level ESL positions. If you have any questions, you can respond to teflonline@teachaway.com and we would be happy to answer any of your questions. Take care, Christie. Hi! I’m slimane, I would love to start moving around the world and teach English, and I’m thinking of taking TEFL online courses, so will I be able to begin teaching abroad just after obtaining my certificate? I’m just wondering if you have an in class TEFL courses coz I am more interactive than online studying type. And also if its the same fees if I take the in class TEFL courses. Thanks. I have a Bachelor degree in English Language and Literature. I want to try my luck, so I want to know whether TESOL, TEFL, or TESL fits me to teach overseas being living in Lebanon and I’m not a native English speaker. Hello Akram, thank you for your comment. If you are interested in teaching English overseas in a country where English is not the first language, the most widely recognized certification to do so is a TEFL (Teaching English as a Foreign Language) certificate. You will find that TEFL courses are offered in a variety of formats, including online, in-person and hybrid programs. You may find a 100% online TEFL course to be the most convenient way for you to complete a reputable course from Lebanon. 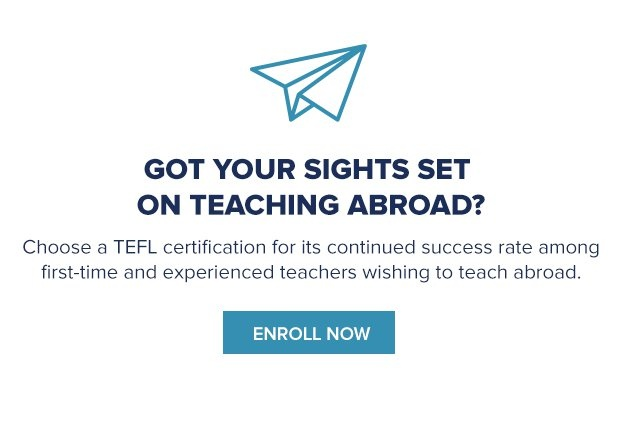 If you would like more information about our online TEFL course options, you can visit: https://teflonline.teachaway.com/enroll/ If you have any questions about our program or teaching overseas, please send us an email at teflonline@teachaway.com and we would be more than happy to answer your questions. Best, Christie. How do I get the necessary practicum experience through this course? I don’t see anything about it mentioned anywhere, but it seems most teaching positions abroad require it. I wanted to teach english in Colombia on a buisness level as well to children- what would you recommend? I wanted to take as many courses as possible to get the best possible salary outcome. Hello Erica! This is a great question. The more qualified you are, the higher your earning potential as an ESL instructor abroad. A TEFL certificate is an internationally recognized certification to teach English as a second language and will be an important qualification to not only qualify you for better teaching jobs abroad, but increase your earning potential. If you would like to teach English in Colombia, TEFL is the most well-suited certificate for you. If you have questions about our TEFL course options, please do not hesitate to email us at teflonline@teachaway.com or reply to this thread. Best, Christie. Thankyou for the lesson ? Course. I’m interested in teaching abroad. Would Teachaway have any positions for a person like me? I am also willing to take the TEFL online to refresh my knowledge as I have not been teaching much ESL during this time. Hello! I’m from Venezuela. Do you offer in-class tesl or tefl courses? Hello Maria! This is a really great question. You can find the answer in our blog about the difference between TEFL and CELTA If you have any questions after reading through the additional information, please do not hesitate to let us know! Best, Christie. That’s great you want to teach English in Thailand! You’ve noted here that you wish to take a TESOL course to teach in Thailand. However, if you’re looking to teach abroad in a country where English is not the first language, such as Thailand, it’s best to get TEFL certified. Our TEFL Online courses will allow you to get TEFL certified online from Thailand. With your 6 years of experience and your current status of obtaining a Master’s degree, becoming TEFL certified is a great way to refine your skills. it is always highly regarded by international employers and will make even the most experienced educator stand out in their job applications against the competition. Once you become TEFL certified, you are to start the job search process. We recommend you start looking at jobs in Thailand and see what is required from the employer. This will most likely include a TEFL certification. If you have any questions about becoming TEFL certified, please don’t hesitate to respond here or by email: teflonline@teachaway.com. Hi, so does it mean that by taking ONLINE tefl course we will be able to teach? and On-site efl course is not an obligation ? I wonder do I have to do a on-site efl course to become a teacher, for example in Thailand or in Spain… or is it also acceptable to get a efl certificate by doing online course? Choosing an in-person or online course is more a matter of preference. In-class experience is not usually a factor for employers when hiring teachers. Moreover, an in-person course is not a guarantee of a well-recognized TEFL course. What you should look for instead is a course length that meets the minimum requirements in these countries and that is offered by a reputable provider. As long as you do that, you can be sure that you’re TEFL certificate is going to be recognized worldwide! I am currently teaching in Japan as an English Teacher in public school for two years now. I also have a TESOL certificate. However, I will be moving to Portugal next year and was hoping to teach English there as well. I would like to take a specific course online in preparation for my move. Which course do you think is suitable for teaching in Portugal? By the way, English is not my native language but I am in a native level. Thank you very much! Thanks for your question. TEFL stands for Teaching English as a Foreign language and a TEFL certification is a certification that qualifies you to teach English in countries where English is not the first language. There are many different types of careers in English teaching. For instance, some subjects like Math or Science may be taught in English and thus a TEFL certification will be invaluable to you in those cases. Subject-specific teachers may be very experienced in the classroom, but it is typically a challenge teaching a group of non-native English speakers for the first time. I am a secondary teacher from India. I have a Bachelor of Arts, Bachelor’s in Education, Masters in English literature and Masters in Education degrees from India. I have more than 12 years of teaching experience in elementary schools and more than 3 years teaching experience in secondary schools. I will be moving to Canada in March and I want to teach. Which course will benefit me most: TEFL, TESOL or TESL? Can I do it online before I come to Canada or I should do it when I reach Canada? This is a question we hear very often. Which certification is designed for teaching within Canada? TESL certification is ideal if your plan is to teach within ESL classrooms in Canada. That said, if you plan on teaching students online who reside outside of Canada, TEFL is your best choice. If you decide TEFL is right for you, I recommend beginning the course at your earliest convenience. If, however, you choose to opt for TESL, a portion if not the entirety of the course will be conducted in person. Hi, I wonder are the certificates obtained by on-site courses and online courses are equal? (EFL)… If I complete 120 hrs online efl course, would my certificate underline that I took online course (not on-site)? When choosing a TEFL course, the two most important things to ask yourself are: Does this TEFL course meet the minimum requirements to teach English abroad? and does it offer you the proper training you need to be successful in the ESL classroom? If it does those things than choosing an in-person or online course is more a matter of preference.